This latest home reno is nowhere near a cafe, so we wanted to bring the cafe into the home by creating spaces and zones where you can share a coffee together, with friends, or alone with a mag. And there’s certainly no shortage of spaces to sit, chat and read now that we’ve worked a little bit of magic on this home. Kitchens are the hub of a modern home and this one is no exception. But rather than including the dining table within this space (like we often would), in this home we’ve created a café style seating environment. Four comfy armchairs all face each other and surround a central coffee table, perfect for entertaining friends with coffee and cake. And there’s the light-flooded window seat, filled with gorgeous cushions, to curl up with a good book in the sun. Of course, the kitchen is also home to the coffee machine and as a café owner myself (The Tuckshop in Glenhaven), and I’m super fussy #coffeesnob when it comes to my brew. I’ve spent a long time trying all the at-home coffee machines to find one that recreates the magic drop I get from my best barista at my café. 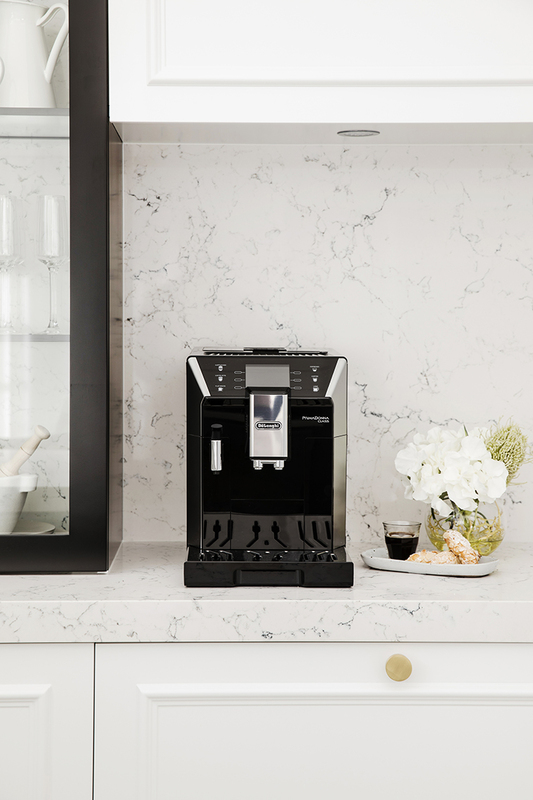 So, you can take it from me that this De’Longhi machine is the Queen Bee of coffee makers. I actually fell in love so hard that I had to get one for my own kitchen too! Not only does she make great tasting coffee, but is really easy to use and no hassle to clean. And get this, you can customise your own order (and those of your mates) and then save it so you’ll all get the same perfect coffee every time, at the touch of a button.